There are many and varied ways of experiencing history. 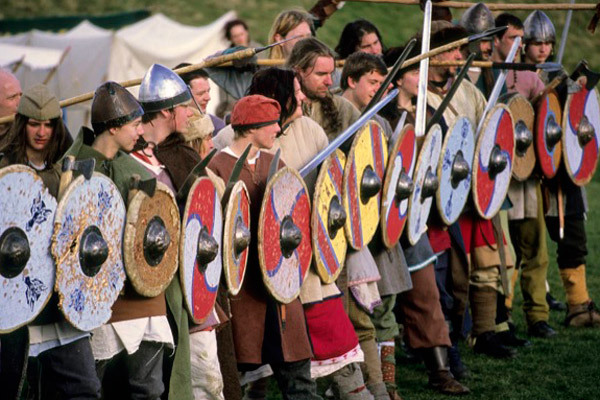 In Vikings of Middle England, members share their passion for history by recreating aspects of the Viking age; through traditional crafts, martial arts, experimental archaeology and dramatic performance. There is no other hobby or activity that offers so many options! The primary goal of the group is to Educate and Entertain at events around the UK. As with any voluntary organisation, there's a certain level of commitment necessary for this to happen, for safety and for the quality of the end product. This means engaging in various displays and attending weekly meetings in Leicester where there is combat training and living history workshops. But that's the business end. 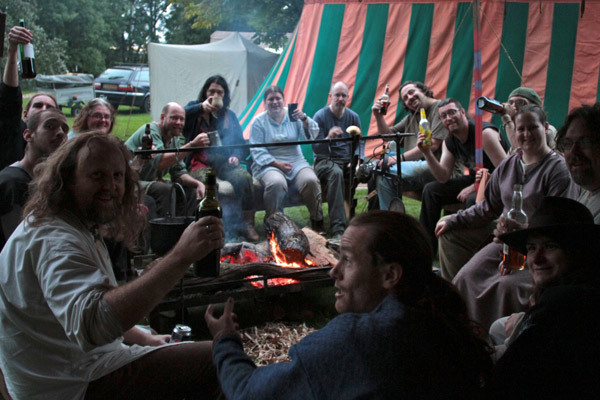 After the site is emptied of the paying audience, the party starts and the extended family of Vikings of Middle England enjoys a break; eating together, playing silly games and having a beer or two ready for the next day of activities. To be a re-enactor is to share and protect our heritage, and at the end of the day fool around with a bunch of good mates. It's an eccentric, electric, entertaining and often absurd hobby - in one word - fun. Feel free to contact us for more details about membership. In the first year of membership, you'll put a basic set of kit together to wear at events. 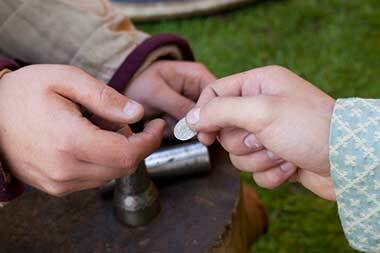 Viking age re-enactment is amongst the cheapest to start, with the 'peasant-look' costing around £100 altogether. We lend kit to new members, and our in-house seamstress and blacksmith (amongst other craftsmen) offer top quality kit for far less than is commercially available. If you're willing to get out your sewing needles, it's even cheaper. Combatants will also get a shield to use. a cloak, pin and hat/hood. You can join from the age of 16 (with parental permission until 18) and no activity carried out at events is discriminated against on the grounds of age, gender, race or disability (where practical). However, all members must do what they can to abide by the group rules and authenticity policies. We have a weekly meeting every Wednesday at 7.30pm at Braunstone West Social Centre, St Mary's Avenue, Braunstone, Leicester LE3 3FT. The meeting costs £3 per session or £10 per month. The first 3 weeks are free. Members are asked to attend as many events and training sessions as possible, or make arrangements with our membership officer where it's impractical to do so. All events are family friendly. In fact, several spectators mentioned that the children running around the camp and taking part in scenarios completed the atmosphere! We are organsed into a group called Tÿrslið and we march under the banner of the Bla Raf. Our leader is called the Jarl and his councillors are called þegns (Th-ay-n). Þegns are officers that perform various duties. 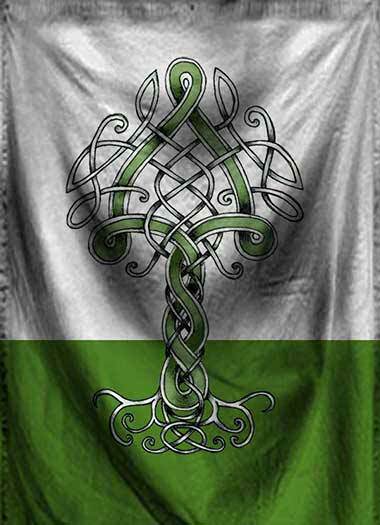 There are currently 7 þegns: Treasurer, Officer in charge of Living History, Officer in charge of Authenticity, Officer in charge of Staging, Officer in charge of Membership and Officer in charge of Booking. The combat þegn is called the Stallari. The Stallari appoints training officers to oversee and teach combat for our battle displays. 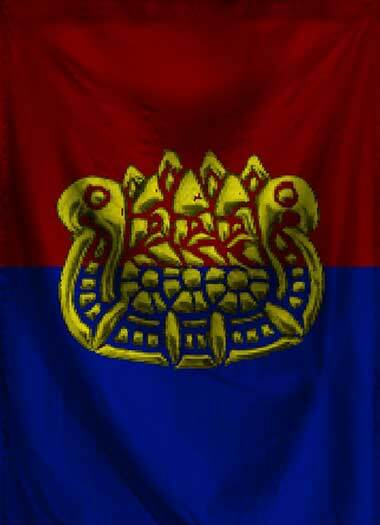 The honorary position of Merkismaðr is given to the person who carries the Bla Raf. All new members are a part of the levy. The levy is headed by the Reeve who helps new people settle into the group and to decide what Viking age persona you'd like to portray. New members join the group at the rank of Thrall. New members can wear very basic kit appropriate to a common peasant or slave - when you are promoted, you can wear better, higher status kit. 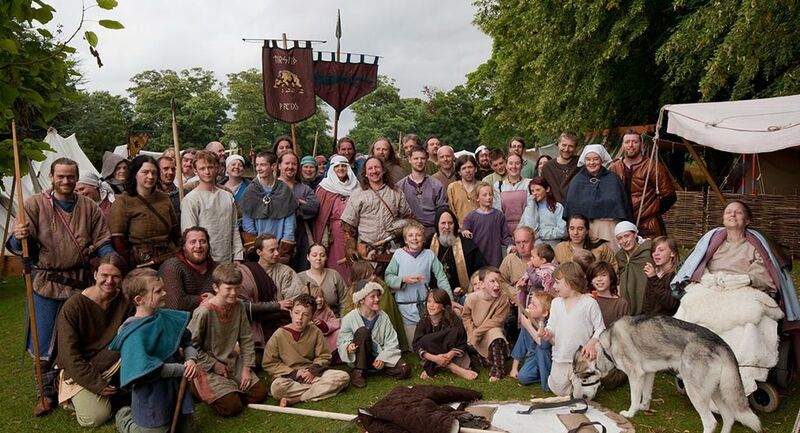 This is to ensure that we always show a cross section of Viking age society and not just the chiefs! Promotions are awarded twice a year; at our banquet in the off-season, and at a weekend event during the show season. The first achievable rank is lysingi. Members who are at the rank of lysingi and above can elect to join a house. Other achievable ranks are: Bondi, a free man; Huskarl, servants of the household; and Landsman, a land owner. Going up the ranks allow you to wear better kit and enjoy certain perks. When you reach huskarl or above, you can start you own house. Because we want to show a cross section of Viking age society, many of our Huskarls and Landsman have started their own households that portray a particular facet of the era. The House Lords are responsible for organising their own house how they'd like, within the group rules. 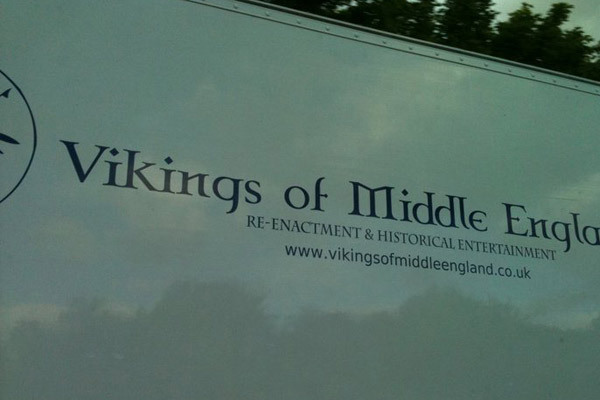 They also make sure members can get to events and training, and perform administration to take the load off from the Reeve and the Membership þegn. 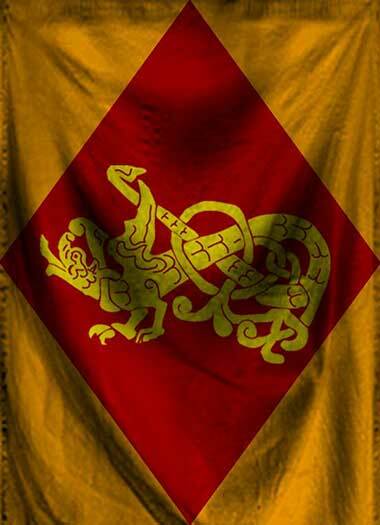 Click the icons below for more information on what our houses portray.